Cipro is a Brand name for an antibiotic drug containing ciprofloxacin as an active ingredient. Ciprofloxacin belongs to the group of antibiotics called fluoroquinolones. This drug is used for the treatment of infections caused by susceptible bacteria such as: acute uncomplicated cystitis, urinary tract infections, lower respiratory tract infections, chronic bacterial prostatitis, acute sinusitis, bone and joint infections, skin infections, infectious diarrhea, complicated intra-abdominal infections in combination with metronidazole, typhoid fever, uncomplicated urethral and cervical gonorrhea, and for prevention and treatment of inhalational anthrax. 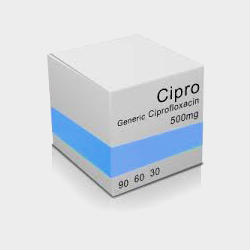 It is available in the form of tablet in doses of 250, 500 and 750 mg, intravascular solution 2 mg and intravascular liquid in dose of 10 mg.
Other Brand names on the market containing ciprofloxacin as an active ingredient are: Cipro XR, Cipro I.V., Proquin XR Cipro Cystitis Pack, Ciloxan and Otiprio. Ibuprofen has the lowest risk of causing gastrointestinal bleeding of all NSAID, producing balanced inhibitory effects on both COX-1 and COX-2 isoenzymes. But, this advantage is lost at high doses. This drug may also inhibit chemotaxis, decrease proinflammatory cytokine activity, alter lymphocyte activity, and inhibit neutrophil aggregation – these effects may also contribute to anti-inflammatory activity. Ciprofloxacin works by inhibiting the enzyme called topoisomerase II (also known as DNA gyrase) and topoisomerase IV. Both enzymes are required for DNA replication, transcription, repair and recombination in bacteria. Ciprofloxacin contain in vitro activity against most gram-positive and gram-negative microorganisms. The mode of action is different from other antimicrobial agents such as macrolides, beta-lactams, aminoglycosides, or tetracyclines, thus, bacteria resistant to these drugs may be susceptible to ciprofloxacin. There is also no known cross-resistance between other classes of antimicrobials and ciprofloxacin. Ciprofloxacin has 100 times higher affinity for bacterial DNA gyrase compared to mammalian. Patients can take Ibuprofen and Cipro together as long as their kidney function is all right. These drugs have different mechanisms of action in the body and have no significant interaction if recommendable doses are taken. However in patients with impaired renal function, concomitant administration of Ibuprofen and Cipro may worsen renal function ( creatinine clearance is lower than < 30ml/min). Taking these two drugs together may further decrease the renal elimination of ciprofloxacin, resulting in elevated levels of this drug in the blood that may increase the incidence of seizures. Patients with a history of seizure disorders, and those who are taking drugs that can lower seizure threshold in the brain or patients with significantly impaired renal function may be at increased risk of developing seizures while taking this combination. The table below shows side effects after Ibuprofen and Cipro administration in recommendable doses. The incidence can be significantly increased if these drugs are overdosed or taken together. Patients should tell their doctor and pharmacist if they are allergic to ibuprofen, ciprofloxacin or any other antibiotic, aspirin or any other NSAIDs such as ketoprofen or naproxen, or any other medicines, or any of the inactive ingredients that can be found in those products. Patients should tell their doctor and pharmacist what prescription and nonprescription medications, nutritional supplements, vitamins, and herbal products they are taking or plan to take. 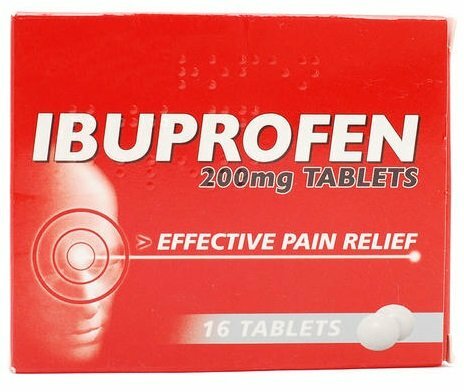 Patients using ibuprofen should tell their doctor if they are using any of the following drugs: acetazolamide, ACE inhibitors such as benazepril, captopril, enalapril, fosinopril, lisinopril, moexipril, perindopril quinapril, ramipril and trandolapril, diuretics, lithium and methotrexate. Doctor may need to change the doses of these medicines or monitor carefully for side effects. Patients should tell their doctor if they are using tizanidine (Zanaflex). Doctor will probably tell the patient not to take Cipro while they are taking this medication. Patients should also tell their doctor if they are using some of following drugs: warfarin , certain antidepressants, caffeine or medications that contain caffeine, clozapine, cyclosporine, diuretics, glyburide, amiodarone, disopyramide, procainamide, quinidine, and sotalol, methotrexate, metoclopramide, naproxen, ibuprofen, phenytoin, probenecid, ropinirole or theophylline. Doctor may need to change the doses of these medicines or monitor carefully for side effects. Patients taking antacids that contain magnesium hydroxide or aluminum hydroxide or didanosine, iron, zinc, calcium,vitamin supplements or sucralfate need to allow some time to pass between when they take a dose of any of these medications and when they take a dose of Cipro. Patients should tell their doctor if they have or ever had or if anyone in their family has or has ever had a prolonged QT interval or an irregular heartbeat, and if they have or have ever had nerve problems, a low amount of potassium in blood, cerebral arteriosclerosis seizures, or liver disease. Cipro may cause confusion, dizziness, lightheadedness, and tiredness. Patients should not drive a car or operate machinery while using Cipro. During Cipro administration, patients should avoid prolonged and unnecessary exposure to sunlight or UV light. Cipro may make skin sensitive to sunlight or UV light. Patients should call their doctor if their skin becomes reddened, blistered or swollen during Cipro administration. Patients should tell their doctor if they are pregnant, especially if they are in the last few months of pregnancy. These drugs shouldn’t be used during pregnancy.